DISCOVER: How you can flip real estate and gain the edge toward financial freedom. It doesn’t have to be difficult. resource book that shows you “How to” Force Appreciation and Flip Fixer-uppers to capture phenomenal profits. M. Mitch Freeland and John Freeland know how to flip properties. With The Millionaire Real Estate Flippers they show you how to do the same with any property, in any market, in any economy—good or bad. Explained by professional flippers and long-time investors, this book takes you into the field and up the ladder of real estate investing--flipping style. It exposes the good, the bad, and the rightfully ugly, from mild fixer-uppers to the massive “el dumpos,” and shows you what to look for and how to profit like the pros. Let Mitch and John explain the nuts-and-bolts, strategies and methods used to secure a real estate profit plan. This book is the real “stuff” and it is destined to be among an investor’s closest companion….Guaranteed! Short-term or long-term, seasoned pro or just starting out, The Millionaire Real Estate Flippers are to the serious real estate investor as ammunition to a soldier or water to a farmer. This book is a required read for everybody seeking financial freedom and belongs in the library of every real estate investor. And it’s on target to be a real estate classic! Why Are We Uniquely Qualified to Write this Book? CHAPTER 1: The Best Type of Property for You…. Advantages of Investing in Single Family Homes vs.
CHAPTER 2: Objective: Short-term or Long-Term…. How Many Properties to Reach Your Goal? How Much Real Estate Do You Want to Own? How Do You Make Money With a Short-Term Objective? How Do You Make Money With a Long-Term Objective? CHAPTER 3: Fix Up: Small Job or Large…. What are the Advantages of Small Fixers? What are the Disadvantages of Small Fixers? What are the Advantages of Large Fixers? What are the Disadvantages of Large Fixers? CHAPTER 4: How to Fix Economically…. Where should you shop for inexpensive items? What Kinds of Flips are There? CHAPTER 6: Pricing for a Quick Sale…. What would an investment property typically look like as a quick fix? CHAPTER 9: Inspecting the Property…. Is it possible to make a six figure annual income flipping houses? How about $500,000 or maybe $1,000,000? Flipping houses does not have to be difficult. We have successfully flipped houses and multifamily properties in California and Florida, and in this book we will show you how you can too. The real estate strategy of Buy, Fix and Sell, aka flipping fixer-uppers, is where an investor is implementing Forced Appreciation. Forced Appreciation is the core result of flipping fixer-uppers. In simple terms, by fixing or rehabbing an investment property, you are increasing the value of the property, in other words, forcing the appreciation. With flipping properties using Forced Appreciation, beginning investors could profit from real estate 100% of the time. Your risk is limited and the profit potential high, when real estate is purchase at the right price. Forcing Appreciation has been around a long time. First introduced by William Nickerson, in his book from 1959, “How I Turned $1,000 Into a Million in Real Estate in My Spare Time” he discusses his technique for fixing-up rundown property. This was the first major book of its kind that spelled it all out for the new type of real estate investor. This technique of creating value is nothing more than what we like to call Forced Appreciation—a term forgotten by the new breed, where you are forcing the appreciation of property by making “valued” repairs—repairs and updating which people, your buyers, want, like and appreciate. Repairs and renovations that present “value” to the end buyer are the necessary things that get your property sold for a nice price. The majority of the repairs, when done correctly, are not complex or overly expensive. They are, nonetheless, a solid investment that will increase value to your property and get you a healthy sales price. We have been investing in real estate for a combined 38 years. We have purchased, fixed, flipped, rented and sold hundreds of single family homes, multifamily properties and apartment buildings. We have improved entire blocks and even neighborhoods using Forced Appreciation. Most properties were vacant, some abandoned and all in distress. Most of the projects undertaken were complete disasters and were considered major fixer-uppers. This is where the investor makes the most money with forced appreciation. Our growth strategy was two-fold: (1) flipping fixers for quick cash flow; and (2) holding a portfolio of rental properties including duplexes, triplex, quads and smaller apartment buildings for long term growth and positive cash flow. We have also invested in raw land (wholesaling), condos, and retail commercial property. We have wholesaled bundled flips to investors and have sold many post fixer-uppers to investors and happy owners and first time buyers. As our flipping business grew it allowed us to form a real estate brokerage firm, a property management firm and a real estate investors association. These are what we call a synergistic cluster because all of the businesses work together to create greater success. And because we had established work crews, it allowed us, from time to time, to contract our work crews to other investors. We made millions in real estate and also lost millions in equity on our apartment buildings during the 2008-2010 Financial and Real Estate Crises, aka the “Great Recession.” We have seen and experienced the ups-and-downs, the good and the bad, and hope to share with you the knowledge that we have gained through our years in real estate in this book. Before beginning our discussion into aggressive strategies of flipping fixer-uppers, we would like to thank you for making an investment in this book. We are honored that you’ve chosen this book among the many real estate investing books available, and we believe you will not be disappointed in the content and practical resource material this book offers. We wrote this book from our years of experience in fixing, flipping and renting hundreds of properties that have ranged from single-family homes, duplexes, quads, and larger multi-family properties. We have always been hands on investors. It's the way we like, and feel that it is the right way for any investor starting out. We also hope you learn the techniques we’ve prescribed to you in this book quickly and without delay; time is of the essence and the sooner you get started the sooner you will benefit from what real estate investing can offer—a lifetime of income and profit, financial security, and freedom to choose the life you desire. Whether making it a fulltime career or part-time to supplement your income, investing in real estate correctly, will allow you to do more of the fun things you enjoy with the ones you love. Historically, real estate investing has proven to be an incomparable asset class. According to The Joint Center for Housing Studies at Harvard University, home values in the United States have appreciated over 5% annually over the past 40 years and the average home price doubles in about 15 years. Moreover, in recent years, there has been an enormous increase of individuals diving head-first into real estate investing. Fortunes have been made and the smart-money will continue to reap big profits; this we know. However, the sometimes easy-money attitude toward real estate investing has propelled many (for the first time) to grasp for a short term wealth model, while ignoring the long-term objective to building true and lasting wealth through real estate acquisition or by real estate flipping—buying, fixing and selling in a short-period of time, whatever the case may be. Real estate investing (when executed correctly) is still never easy, and if executed incorrectly—disastrous! You must constantly be on the lookout for the right investment properties and buy at the correct price. In the old days people use to compare real estate investing to the stock market. There were people who loved stocks and would not bother with real estate. The reasoning behind this was a common one. Stocks are now, today—stock prices move daily—every second they move up or down. Stocks are liquid. Buy today, sell tomorrow—cash now! Real estate is slow—it’s long-term. We use to think this way back in the old days. You could become a millionaire faster in the stock market when you have little money. So, the first ten years of our money was invested in stocks not real estate. Then something changed. Stocks became extremely volatile and the market crashed again. Our investments were all over the place—one day up $50,000 and down $50,000 the next. Up $200,000 for the first week of the month and then up only $40,000 at month end. There was no control. We could not force appreciation on a company or stock. We then began to take a more serious look at real estate and in a very short period of time, found what we were looking for. We could buy real estate, in many situations, less than 25 percent below market value. This could be accomplished through distressed sellers and foreclosures. We could not do this with stocks. We could buy real estate with little cash. For example, with $10,000 we could control $100,000 worth of real estate (10% down). In the stock market we could only control $20,000 worth of stock on margin. We could buy real estate with zero down and control it 100 percent. With stocks this is impossible. If we bought distressed real estate and fixed it up we could directly force appreciation on our investment capital. You cannot do this with stocks. If we wanted to rent property and receive a high monthly income over 20 percent, we could do this with the right property. This is very rare with stocks. We would control as much property as we could handle with a minimal of cash and increase our net worth substantially through real estate. Imagine, you invest $20,000 and purchase a $200,000 house. You invest another $25,000 rehabbing the house. After you have finished, a new appraisal shows that the property is now worth $300,000. You have increased your value by $55,000. Your total investment was $45,000 (down payment plus fix up cost). Your gross profit is $55,000 or 122 percent of the cash you invested. It would be very hard to show a profit like this in the stock market in a matter of a few months. With stocks, you buy and sit and see what happens. With real estate you act, you become proactive and force appreciation on your investment. You do not sit and wait to see what happens. You make it happen. You are in control of the situation. You have a direct hand in making your investment work for you. Real estate investing is a business like any other business and you will lose money if you make the wrong choices. Many new investors, along with experienced investors, have lost countless millions during times of economic downturns and over leverage. This is a common mistake of overly aggressive investors. Don’t get us wrong—we have known many successful real estate investors who have made substantial fortunes. we have also known many more that have attempted to become investors but simply could not understand how they went astray, how they failed. Our mission for this book is to make you succeed for the long-term, opportunity after opportunity, year after year and decade after decade, in booming markets and in busted markets. It is our hope to make you a successful real estate investor—an investor to succeed by using the main strategy presented in this book--Forced Appreciation—creating value in your properties beyond appreciation by inflation. Flipping is about forcing appreciation. Have you thought about making 50% to 60% profit on each property you buy within a three month or one year period? That is the average percentage you will make when you follow the strategies in this book. Your actual cash-on-cash return will be much higher depending, of course, on the amount of leverage you use. This figure could be well over 100%; that’s 100% profit. These are not made-up percentages; they are numbers made everyday by professional and astute part-time, fulltime, new and experienced investors. And these are numbers that are attainable for you. How does this all sound to you so far? If you are a little skeptical that’s okay, because after you have finished this book and applied the material in it, you’ll not only have the confidence to go out on your own, but you’ll also have the tools to lead you through the journey of forcing appreciation. Are you ready for a new beginning? If you have failed or feel you have failed in past real estate investing, or you haven’t achieved the success you’ve dreamt about, or have failed in other investments or business ventures, then listen to these words of wisdom: Zig Ziglar, the great motivator, categorizes failure as an event not a person—an event in your life that has happened—but it does not characterize you. Failure is typically the result of a poorly conceived plan or not sticking to it long enough to produce measurable results. Remember what Ralph Waldo Emerson said, “Our greatest glory is not in never failing, but in rising up every time we fail.” One of my other favorite quotes is from Winston Churchill, “Success is going from failure to failure without a loss of enthusiasm.” That quote says it all. This has a lot to do with believing in what you are doing and why you are doing it. Sometimes, while in pursuit of the old mighty million, we neglect to spend a few moments thinking about a clear plan of attack or a long-term plan for our success, a strategy to get us from point “A” to point “B.” Because of this, we sometimes fail. Though we have all failed at something in our lives, we are better off for trying and failing, than not trying at all. If you only knew how many failures we had, individually and together, you simply would not believe it. The idea is to keep moving—try it again or try something different. Don't give in—don't give up. Failure opens our minds, and with understanding, it will make us into better and more observant human beings and entrepreneurs. We believe if you have had past failures in real estate, this book will help demystify your concerns and answer your questions thoroughly regarding flipping. If you are new to real estate investing, then you are on the correct path with this book. Unequivocally, everything in this book is proven and works. This book is more than just an introduction to doing fixer-uppers correctly, it is a resource guide which you should refer back to regularly. When the information in this book is applied correctly and diligently, failure will soon become a word from your past. Moreover, this book will help you to understand proven concepts that will enable you to secure a successful real estate investment business, whether pursued as a part-time endeavor or a fulltime investing career. Furthermore, as an example, this book is not like a road map to your real estate fortune. It is not a “one-stop-shop”; no book is, or should purport to be; it is, however, the course that will put you on the map. To illustrate this, let’s say you are in Miami and you want to go to Los Angeles. The first thing you do is buy a road map. You map out your destination and you then hit the road—you begin your journey. Once you’ve arrived in Los Angeles, you are no longer in need of your map and you neglect to open it again until such time comes when you need or want to go back to Miami. Now, the message in this example is for you to not discard or neglect to review the information in this book after you’ve arrived. This book is not like a road map to be discarded after you’ve arrived. Instead, you should review the text frequently, even after you feel that you’ve arrived. Every time you read it, you’ll pickup something new, something you’ve missed, something you’ve forgotten. This is common. In fact, this is why you read the same books over and over again. Do take notes and mark-up the book with a pencil or highlighter if necessary. Take notes and write in the book wherever you please. Building knowledge to succeed in real estate investing is a journey that requires a time investment. However, if you have the desire, motivation, tenacity, and a clear vision of what you want, you will succeed in accomplishing your goals and fulfilling your dreams. As leadership expert John C. Maxwell puts it from his book Put Your Dream To The Test, “Clarity of vision creates clarity of priorities.” Make sure you have a clear vision of what you want and your priorities will fall in place. Most chapters in this book can be read independently—that is, no single chapter is a prerequisite for the others; however, Chapter One and Two should be read first. They explain the best type of property for you and flipping. This book is for every investor: beginners and part-timers, experienced investors with a lot of capital and investors with little capital and big dreams. This book is for everybody interested in making money flipping real estate. This is a “how to” book from the core, and the concepts presented in it should be reviewed, studied and explored regularly. This book will equip all who practice the principles, strategies and methods presented here for investing in and flipping properties for profit. First and foremost, you must start the Right Way. The Right Way is the only way to ensure you follow the proper risk to reward ratio. There are numerous ways to invest in real estate. Most are high risk with low reward. We believe in only investing in properties that show a low risk (bought at the correct price), high reward return. How do you do this? You will learn this and other techniques professional flippers use to maximize profits and protect against loses. You cannot be an expert in one facet of real estate and be successful—you must be an expert in all of them. The information and strategies outlined in this book must be incorporated in every investment you make. When applied jointly, the information in this book and your collective opportunities (investments), and what you’ve learned will empower you to become a success in real estate investing. In time, these concepts will become second nature to you and you will begin to apply them without really thinking about the specific application. An expert can make money in any market. Anyone interested in making money in real estate should have a comprehensive knowledge of the forces that move or do not move real estate in a particular area. This book will show you that and much more. The question is, “Why?” The question you should be asking yourself with every concern is “Why?” Why should I invest in this house? Why should I use granite counter tops instead of Formica? Why should I use Formica instead of granite? Why paint the house yellow? Why do I need to hire an electrician? Do you get the idea? Professionals all ask the “Why” question. There is a logical reason for this. “Why” cuts through all the junk and gets you the answers you need. Ask yourself “Why?” with every decision you make and you’ll come up with the right answer. When you write down the reason “Why” you want to follow a certain path or “Why” you want to use a specific color, tile design, faucet style or roof color, write down the reason “Why”—if you do not have a reason, then you’ve made the wrong choice. Go back to this book to the chapter that may help you decide the right answer. After you’ve completed this book, you will have gathered enough general knowledge to feel confident to move forward in your real estate investing endeavors. And if you follow the suggestions set forth, we believe you will have a long and profitable investing career. GOOD LUCK IN ALL OF YOUR INVESTING. DISCOVER LANDLORDING IN A WHOLE NEW LIGHT! 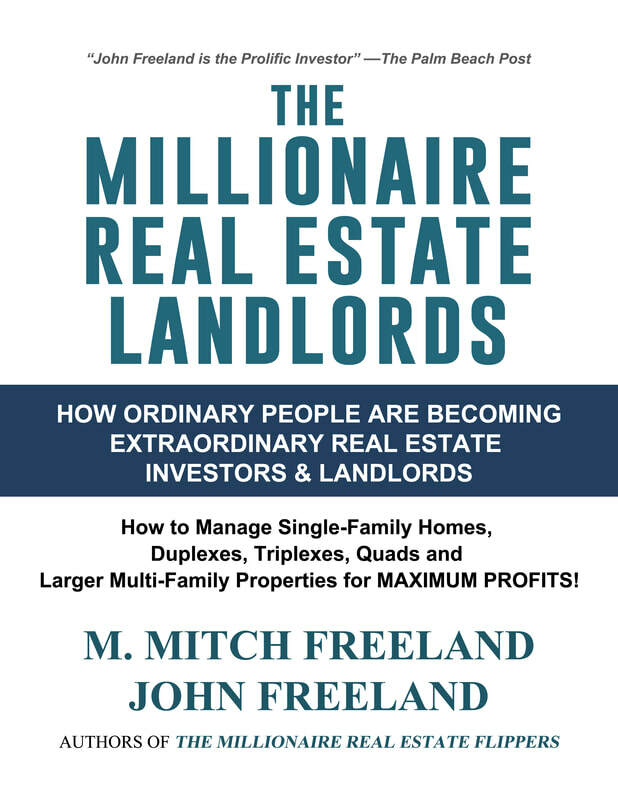 In The Millionaire Real Estate Landlords, investors M. Mitch Freeland and John Freeland have rewritten the rules on active real estate investing and landlording. The Millionaire Real Estate Landlords covers all the essentials necessary for you to achieve maximum performance by utilizing a proactive approach to landlording.If you own rental houses, a duplex, a triplex, quads or larger multi-family properties, this book will prove that BIG PROFITS are attainable for you with the right system. No investor should be without this book. It clarifies and cuts-through the steps needed to succeed in the lucrative world of landlording. You’ll learn the strategies, the techniques of successful landlording—and the hard-driving truths that turn dreams into financial reality with spectacular cash flow. This trend setting book is in a new style, a new era of “How To” books on real estate and landlording. With revealing insight, the knowledge you’ll gain from High Engagement Landlording will carry you successfully and stress-free to the next generation. Have you ever wondered how it would feel to be a man or woman of property? Let us show you the way. Trust Mitch and John Freeland to transform you into a successful property owner, a landlord to be respected, admired and envied. Mitch and John have managed hundreds of tenants in all rental classes: single family homes, commercial retail, small multi-family and larger apartment buildings. They are the genuine article with years of experience and knowledge—the pacesetters of landlording. 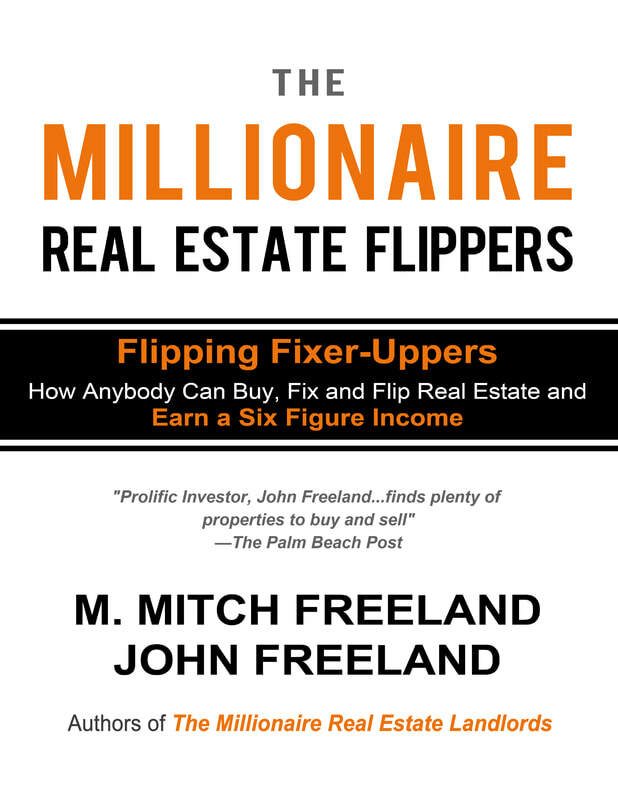 Mitch and John Freeland broke the mold in The Millionaire Real Estate Flippers—and The Millionaire Real Estate Landlords is certain to take its place on the list of best-of-the-best real estate books of all time. What do You do With an Onsite Manager? What about Professional Property Management Companies? Do Tenants Understand their Obligations? What are you Required to Disclose on Lead-Based Paint? Are you Really a Landlord? Are There Other Operating Expenses? How Do You Project Your Future Cash Flow? What does the “Qualified Intermediary” Charge? What types of Real Estate Investments Can you Participate In? What’s being Presented? What’s being Offered? Who is In Your Organization? The proactive real estate investor and the proactive landlord is highly engaged—that is, he is active in all facets of the investment process. Because he is highly engaged, the proactive investor transforms a good investment into a great investment. He does this by nurturing the investment along until such time that the investment is sold. By acting and not reacting, an investor can take control of his situations and take full responsibility for the outcome of every stage of the investment process: from utilizing contractors and sub-contractors, to fighting for lower property taxes, and managing tenants for maximum cash flow. The proactive, highly engaged, real estate investor produces higher than average income. He is not a passive investor. In his 1946 book, Man’s Search for Meaning, Viktor Frankl first coined the term “Proactive” to explain how a person is responsible for oneself and that outside circumstances are not the cause of a particular situation—and that others are also not the cause to one’s successes, failures, crises or the unhappiness in one’s life—everyone has the freedom of choice, even in dire situations. You must have faith in your abilities and faith that your future will be better and brighter all the days to follow. Frankl, a psychiatrist, first designed his concept of proactivity as a prisoner in German concentration camps during the Second World War. His parents and wife died in the camps. Being proactive was a way of thinking—a way of surviving—and a way of being free. Although, still behind fences and physically controlled by guards, his captors could not control his thoughts—those were his to control. The prisoners whose thoughts were optimistic for better days, while being held captive, survived better from the day-to-day horrors of camp life, and did not suffer as much; mentally they were in control. The ones that gave up had a tendency to suffer more and died. The power is in controlling your thoughts. There is a way of thinking, a way of doing things better, and doing things the proactive way. Proactive investors are in control. It is said, that real estate is the best investment in the world. We disagree with this statement, and I’m sure anyone who has lost money in real estate would disagree with the statement as well. An investment in any real estate is only as good as the investor behind it. It takes time and a lot of hard work to locate, analyze, buy, manage, and sell real estate. The best investors, as we have mentioned many times in other books, make money in good times and in bad times. A professional investor can also make money in any market, in any city, and in any area—this is a proven fact. There is a systematic approach to success in real estate investing—a process. A professional real estate investor doesn’t wait for property to perform; he buys it correctly in the beginning and manages it proactively to perform in ways beyond average appreciation and the inflation rate. As in any investment or business, real estate investing can produce outstanding returns for the investor, especially when the investor begins to think creatively, imaginatively and is able to communicate effectively with others. Working in harmony with others is also necessary for success. Having an optimistic outlook and positive expectations for the future and enforcing a proactive management style is a prerequisite to your overall success. When challenging situations arise, the proactive investor understands that nothing is as bad as it seems, and there is a solution within reach. Taking time to think, and to think with full concentration, is the right beginning to every critical decision, and the proactive investor understands this activity all too well. A clear thought will more often than not, produce a clear decision. There are thousands of landlords out there making millions of dollars a year renting property. Landlording has been around for thousands of years. How would you feel about receiving a couple of checks in the mail on the first of every month for $2,500, and the work you did to receive it took two hours a month out of your time? Sounds pretty good doesn’t it? Landlording can be fun and extremely profitable with little overall labor expended when executed correctly. This book is about executing the activity of landlording correctly. Becoming a landlord is not difficult and the activity of landlording should not be something you cringe at. Landlording is easy when you know how to manage people (your tenants). When you have great tenants there is little for you to manage. The idea for this book is based largely on getting good, solid, respectful tenants. The rest is just managing the little problems that pop-up occasionally as in all business related activity. Why We Are Uniquely Qualified to Write this Book? We have managed over 100 units at a time, ranging from single-family homes, small multi-family properties (duplexes, triplexes, quads, eight unit buildings), and larger multi-family apartments and assisted living facilities. We have always been hands-on landlords since starting fifteen years ago. We believe good landlording has two characteristics: (1) clear communication with tenants; and (2) serving your customer (tenants) with integrity and fairness. Not all tenants will be good tenants—you make the choice. Good landlording is specializing in good customer relations—it’s all about managing people. Now that we’ve gotten all this out of the way, it is now our hope that you have a general idea of the workings of a proactive investor/landlord and what will be expected of you to succeed. In fact, this book is a companion to our first book, The Millionaire Real Estate Flippers. Both Millionaire Flippers and Landlording can be used together; they complement one another and include enough information to launch you on your way to successful real estate investing (flipping) and landlording. Both books also cover a hands-on approach to investing by forcing appreciation and thinking and acting proactively about managing people (tenants), and managing construction crews for rehabs and renovations. As always, GOD BLESS AND GOOD LUCK TO GREAT INVESTING AND LANDLORDING! DON’T LET VACANCIES RUIN YOUR CASH FLOW! In How to Rent Your House…., M. Mitch Freeland reveals 129 simple ways that landlords can fill vacancies fast. and substantially increase cash flow. A special section is also included with money generating ideas for Airbnb rentals. Owning and managing over 100 units for many years, Mitch has discovered that rental houses and multi-family rentals deserve a hands-on, proactive approach from landlords who want to get the most out of their investment. Passivity is not the way to riches—let service ring the bells to prosperity, and let Mitch Freeland show you how. Mitch has managed hundreds of units in all classes: single-family homes, duplexes, triplexes, larger multi-family properties, and commercial retail. How Do You Get Positive Cash Flow from Your Rentals? How Can You Make Money with Renters Insurance? If you would like to learn more about renting your property, landlording or flipping houses or participating in flips, contact Mitch at MMitchFreeland@ gmail.com. "THE PROLIFIC INVESTORS ARE BACK!" "Can you get rich in real estate by following local, state and federal government actions? You bet you can! By the authors of The Millionaire Real Estate Flippers and High Engagement Landlording, prolific investors M. Mitch Freeland and John Freeland reveal how government increases the price of real estate and how you can get the edge investing in special pockets in your community. In The Real Estate Hustle, we examine a number of ways governments, at all levels, have forced real estate prices up. From restricting land availability, onerous building code requirements, limits on annual permits and many others. In this book, you’ll be introduced to the many ways in which government planning increases property values; how government accomplishes it, and the specific communities that are currently affected by these plans. Knowing where to invest can be a daunting task. Every city or community has sections of robust growth. The Real Estate Hustle will open your eyes and give you the knowledge to exploit real estate investing opportunities in your community. How to identify and take advantage of the opportunities in your area that are overlook by the majority of investore. Governments have a way of manipulating real estate prices. This means they have the power to force prices lower as well as higher, and they exercise this power regularly. There is more than enough information in this book to support this fact. You will learn how smart investors are cashing in by investing in areas where governments intervene. Governments manipulate real estate prices in nearly every community. Chapter 1: What is Smart Growth Planning and Why Should you Care? Chapter 5: Can Government Intervention Backfires? Super Bubble in Real Estate? With The Real Estate Hustle you will learn the tactics and measures governments use to increase real estate prices and how you can be on the RIGHT side and in the RIGHT location be benefit. Every investor should know firsthand what their local government and federal government are doing in their area. If you own real estate or plan to in the future, you need to read The Real Estate Hustle. "Government intervention and growth-management planning is a subject not usually associated with the rise and fall of real estate prices....Yet it is a major culprit of price volatility. " When you know how to increase the value of real estate, you know how to force appreciation. Your overall risk is low when you discover the process of sound property selection, have a handle on repair costs, and you have determined your selling price prior to submitting an offer to purchase. Knowing your profit before you buy is successful real estate investing. The lessons in this book are a concentration of essays on making you better with dealing with people, organizing your business, communicating effectively to secure the greatest opportunities, and making you an all around top shelf investor—an investor with many abilities, including making real estate more valuable. ISN'T IT TIME YOU DID SOMETHING WITH THAT FIXER-UPPER? Are you thinking about getting into house flipping? Are you ready to pull the trigger but there is something holding you back, yet you are not sure what it really is? Perhaps you are apprehensive about making an offer? "How to Get Offers Accepted Fast" will show you how to secure real estate quickly and easily, so you can start your flipping enterprise. This book will benefit anybody who wants to buy real estate--just one house or a bundle of propertits. "PROLIFIC INVESTOR JOHN FREELAND...FINDS PLENTY OF PROFITABLE PROPERTIES TO BUY AND SELL,"
• Deal directly with the Owner without a real estate agent. • Handle bundled offers from a seller. • Deal with real estate agents. • Deal with earnest money. • Follow-up after an offer is submitted. • Negotiate for a lower price after an inspection. • Negotiate with different types of motivated sellers and to get the information you need to make a good offer. • Deal face to face with a seller. • Deal over the telephone with a seller. • Offer seller financing techniques. • Call on a post-foreclosure property. • Deal with an agent who submits offers for you. • Negotiate while never meeting the seller/buyer. • Distinguish between which if better, price or terms. • Read your Standard Purchase Contract and understand it. • Read your Standard Sellers Contract and understand it. • Read a bank (lenders) pre and post-foreclosure contract. • Draft an “All Cash” contract. • Draft a “Seller Financing” contract. • Ask questions to the answers you’ll need to make an educated offer. When you download 5 Day Flip today, you’ll get an easy to follow plan for submitting offers that get accepted on your prices and terms. "How much is that property worth? What is the monthly income? Successful Real Estate investing is sound CASH FLOW investing—it is all about the numbers." Freeland explains each of the ten calculations in simple terms. You don't have to be a mathematician to figure this stuff out. Freeland makes it simple and easy to follow. "By applying the calculations in this book, you can feel confident that you are armed and ready to dissect any property anywhere and conclude whether it is a good investment with strong and potentially growing cash flow." With a few calculations you could determine the current value and the future value of real estate. Successful investing is about the numbers. You can use numbers to see the future and you could use current numbers to help predict troubling times ahead. The numbers don't lie. An income investor needs cash flow. The numbers will tell him whether his future investment is going to be profitable or a cash drain. It is easy to figure this out. But sometimes investors don't run the property numbers correctly, leaving expenses or upcoming expenses out of the equation. The result, the great investment becomes the alligator devouring cash. With The Cash Flow Book you will have tools to combat this situation. Lots of case study examples from different types of properties: single family homes, duplexes, four-plexes, and small and large apartments. YOUR PRE-ORDER PRICE $17.95 SAVE NOW - ORDER TODAY!